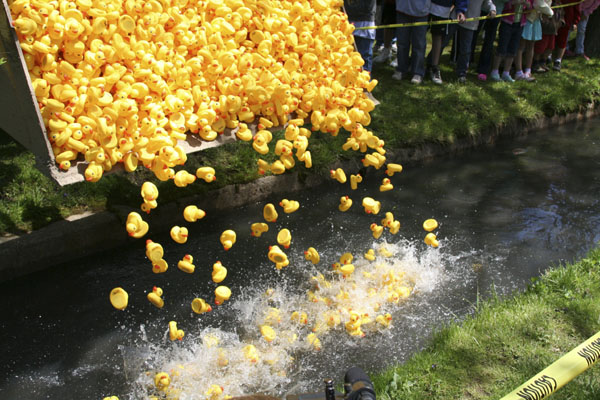 Well, thanks to the Wisconsin Department of Justice's decision last year to crack down on rubber-duck racing in the village of Mishicot, having concluded said event amounted to illegal gambling, the Wisconsin legislature has had to intervene. The state constitution prohibits "gambling in any form," and then of course proceeds to list a bunch of forms that are totally fine. One of these is the "raffle." The constitution doesn't define "raffle," probably on the assumption that most people know what that means, but the term is defined by statute anyway: it is "a game of chance in which tickets or calendars are sold and a drawing for prizes is held." Or at least that's what it was. Anyone wishing to do this must ensure that the duck race conforms to the above rather elaborate requirements, and must pay a license fee of 25 dollars. To have a duck race. The current version of the bill also provides that other forms of "raffles" might be okay too—basically, the state may approve other kinds of raffles if it wants to but it must approve any duck-race raffle. So now I'm really looking forward to seeing what other things people come up with. The state's Department of Gaming doesn't seem to be too happy about that, though, because according to the fiscal estimate prepared for the bill it does not expect to be able to cope with the expected increase in raffle applications, and will need to hire an additional employee for that purpose. So I guess the good news is that the bill will create at least one new job in Wisconsin. If there were any opposition to the bill, then I suppose the sponsors could pitch it as a "job-creation measure." But there isn't.